While many people look at the inner workings of Capitol Hill and believe that they cannot make a difference in issues that you care about, interviews and statistics from key staffers and members of Congress show a different story. 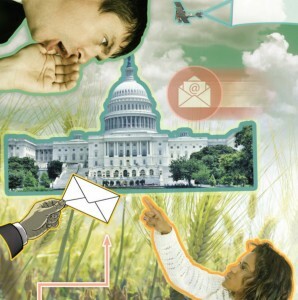 The Congressional Management Foundation, a D.C.-based non-profit organization, routinely surveys congressional staffers and members of Congress to discuss how to best communicate with your elected officials. Almost universally, constituent visits are an incredibly effective manner of influencing an undecided member of Congress. A whopping 97 percent of respondent said that a visit to the Washington office had “some” or “a lot” of influence on an undecided member. A nearly identical 94 percent said a visit to the district office influenced their boss. Visits from lobbyists to the Washington office register at 82 percent having “some” or “a lot” of influence on an undecided member. However, once those numbers are broken down further, you will see that citizen advocacy from constituency carries far more weight than any visit from a lobbyist does. Just 8 percent of staffers said in-person visits from lobbyists carried “a lot” of influence on their boss, while 46 percent said the same thing via in-person visits from constituents. Essentially, I am stressing the important role that every American citizen can play in ensuring that effective legislation does get through Congress on issues that you care about. 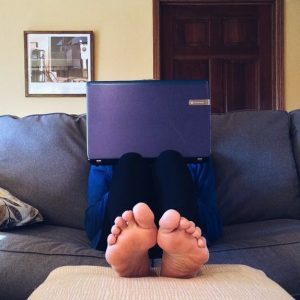 And, as NCRA members, I hope you are willing to take the next step and be helpful with NCRA’s grassroots campaign to ensure that the Training for Realtime Writers grants are reauthorized. Now, even if you cannot travel to Washington, D.C., or the district office to meet with your members of Congress, that does not mean that you cannot be helpful to any grassroots campaign. The same study by the Congressional Management Foundation found that direct, personalized postal letters (90 percent) and personalized emails (88 percent) have “some” or “a lot” of influence on an undecided member of Congress. When you share your story with a member of Congress, you become part of the dialogue on issues that matter. Oftentimes, when I am watching congressional debates, I will see a member of Congress referencing a letter or in-person visit from one of his or her constituents to help prove their point. To assist, simply go to www.ncra.org/government. You should see a button asking you to take action now. You will eventually be led to a page that will allow you to directly contact your two senators and one representative. 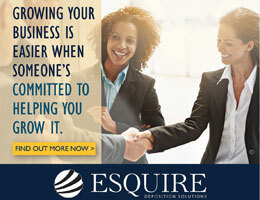 This will allow you to tell your unique story about what court reporting and captioning have been great career choices and why more people need to know about that. 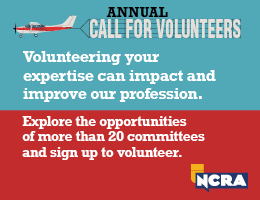 Your help with directly contacting your members of Congress will help ensure NCRA’s success in the upcoming legislative battle that we expect to take place over 2016 and 2017. Now, I know it is easy to complain about the overly politicized and partisan Congress that we have right now. But as citizens, we all have a role to ensure that our elected officials are accountable to the policies that we are interested in. In 2012, only 55 percent of the country voted in the presidential election. A significantly smaller number than that directly contacted their member of Congress on an issue that is important to them. By exercising your first amendment right to petition the government, you significantly enhance the likelihood of Congress enacting policies that you favor. In this case, I’m urging you to help NCRA’s grassroots campaign and help ensure that the Training for Realtime Writers grants are reauthorized and the funding remains available to court reporting and captioning programs. Adam Finkel is NCRA’s Director of Government Relations. He can be reached at afinkel@ncra.org. An increase in the demand for CART services in the Chicago, Ill., metro area recently prompted MacCormac College last fall to launch a course geared toward working reporters and graduates of NCRA-certified court reporting programs wanting to transition to realtime or achieve realtime certification. Funded by a five-year grant the college received from the U.S. Department of Education’s Training for Realtime Writers grant program, which is part of the Higher Education Affordability Act, MacCormac’s program has attracted attendees with experience ranging from 10 to 20 years of professional reporting, Dorchack notes. When the program first began, it was conducted over three semesters and included six classes of three hours each for a total of 270 clock hours, she explains. However, based on feedback from the students and the court reporting community, the program was revised and is now being offered as a continuing education program consisting of three modules of 40 hours. “The first module focuses on improving realtime writing. The second module continues work on improving realtime writing and includes specific instruction on CART. The third module continues work on improving realtime writing and includes specific instruction on captioning,” Dorchack says. According to Kathy A. Cortopassi, RMR, CRR, CRC, from Crown Point, Ind., a court reporter with 30 years of experience who has also provided CART and captioning services for 20 years, the course offered by MacCormac is especially useful for reporters who want to spend less time editing out errors, reduce conflicts, improve accuracy, compete in NCRA’s realtime contest, or just plain improve their skills. “I actually would like to learn how to be a better teacher,” Cortopassi says. She anticipates that having taken the class will help her to achieve her Certified Realtime Instructor certification. According to Dorchack, the college plans to offer the realtime-focused course again in 2016. For more information, contact Natasha Meeajane, director of communications, at nmeeajane@maccormac.edu. On Nov. 20, Sen. Tom Harkin, chairman of the Senate Health, Education, Labor, and Pensions Committee, introduced the Higher Education Affordability Act, a bill that would reauthorize the Higher Education Act and includes funding for the U.S. Department of Education’s Training for Realtime Writers grant program. The grant program contained in the original law was approved due to a legislative campaign NCRA launched and supported throughout multiple legislative cycles. Since the first Act took effect, NCRA has helped court reporting schools secure more than $16 million in Training for Realtime Writers grants, typically used by recipients to upgrade equipment and facilities and enhance program curriculum. NCRA has announced that two of its certified schools, Madison College in Madison, Wis., and Green River Community College in Auburn, Wash., were recently awarded five-year grants from the U.S. Department of Education. The funding is part of the Training for Realtime Writers grants under the Higher Education Act passed by Congress in 2009. The U.S. Department of Education’s Training for Realtime Writers grant program was, in part, approved due to a legislative campaign NCRA launched and supported throughout multiple legislative cycles. Since the Act took effect, NCRA has helped court reporting schools secure more than $16 million in Training for Realtime Writers grants. Read more about Madison College. Read more about Green River Community College. NCRA was one of approximately one hundred organizations that submitted written testimony for the hearing, Driving Innovation through Federal Investments. To view Senate Appropriations Committee Chairwoman Barbara Mikulski’s opening statement, as well as other organizations’ written and oral testimonies, visit the Senate Appropriations Committee home page. Contact NCRA’s government relations department with any questions. 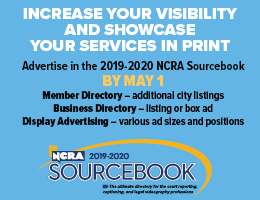 NCRA’s Taking Realtime Awareness and Innovation Nationwide committee offers court reporters advice and inspiration on taking the next step in providing realtime, whether it is rebuilding a dictionary or providing guidance on the options for wireless display. One of the hardest decisions court reporters who are planning to provide realtime face is deciding what equipment to use. Here is a guide on what the op­tions are. I’ve attempted to answer the questions that come up most often to help make the decision easier. What do I need to write realtime with serial cables? Check with your specific CAT vendor for detailed information, if possible. For one realtime hookup, a typical setup would look like the photo above. You will need two USB-to-serial adapters, which change a USB port to a serial port – most computers no longer have serial ports. You will need one for your CAT com­puter and one for the realtime computer. You also need a SEND adapter (which is blue in the photo above) and a RECEIVE adapter (goldenrod) and a realtime ca­ble. Depending on the vendor you buy your adapters from, the colors will vary. If you already have purchased adapt­ers and cables that are not color-coded, here’s a great tip: Take a silver-colored Sharpie and label your adapters; write on the cable as well (if it’s black). Label the cables that go with those specific adapt­ers because you cannot mix and match adapters and cables from different ven­dors, i.e., Stenograph cables with Eclipse adapters or Steno Doctor cables. *Note: Your USB-to-serial adapter will come with a “driver.” On some comput­ers, you will need to load that driver onto that computer so the USB-to-se­rial adapter will function properly. In the photograph, there are two different kinds of USB-to-serial adapters (one is silver with a blue adapter and one is silver with a blackish adapter). Again, check directly with your CAT vendor for their specific recommendations. I know I keep saying “check with your specific CAT vendor,” but it can make a differ­ence, and it is a step worth taking. They have tested and vetted the cables on their equipment and software, and they know what works best. Need more information? Contact your specific state TRAIN rep through NCRA.org. For detailed troubleshooting information on USB-to-Serial adapters and installing drivers, go to the NCRA Store and purchase the Realtime Troubleshooting Pocket Guide, Version 2. What do I need to write realtime with serial cables to more than one computer? You also need a Multi-Line Block (pictured at left). How this all plugs in takes a little prac­tice, but once you understand how things work, it becomes clearer. It also becomes easier the more you do it. You can purchase a Multi-Line block in the section of Target or Wal-Mart in the phone de­partment for around $5. The Multi-Line block piece of hardware is literally a simple phone splitter. As you can see, from the CAT computer comes the USB-to-Serial adapter that plugs di­rectly into the SEND adapter (blue). The Multi-Line Block cable plugs directly into the SEND adapter (blue). Any and all computers you want to receive realtime feed will plug directly into that Multi-Line Block with their realtime cables. At the end of the realtime cable will be the RECEIVE adapter (goldenrod), which then plugs into a USB-to-serial adapter, which then plugs directly into the USB port of a realtime computer. Stenocast is a way to write realtime using a wireless Bluetooth serial con­nection. You still have some hardware components to connect to your CAT computer and all realtime receive computers (the transmitter and the dongles/receivers), and you will have to load drivers onto every new real­time computer for the dongle to work. You don’t have all the messy cables to worry about with Stenocast, but it’s also not as easy as just joining a Local Area Network and starting to write (as you would if you were using a router). Some might say Stenocast is somewhere between using serial cables and using a LAN. What do I need to write realtime with Stenocast? Check with Stenocast for more specific information – they have a num­ber of different choices and prices with their various setups. Also, the Realtime Troubleshooting Pocket Guide has step-by-step instructions on how to send your realtime feed via Stenocast. As you see in the photograph, there is the Stenocast transmitter that plugs into the reporter’s CAT computer (it’s not plugged into anything in the picture, however). You also have a red or blue dongle (a device that is connected to a computer to allow access to wireless broadband or use of protected software) that plugs into every realtime receive computer. Why do you use a router? To write realtime without using serial cables or Stenocast dongles. What kind of router should I buy? Although any router will work to create a Local Area Net­work, check with your specific CAT vendor. They have good recommendations. Can my software write realtime wirelessly? Check with your specific CAT vendor. You may have to purchase a license from your CAT vendor or upgrade your software to allow you the ability to write wirelessly. Does every router have internet access automatically? Unless it’s a specific Internet-ready router (like a Cradle­Point) and you are paying a monthly fee for the Internet usage, usually through your cellular provider, the simple answer is no. Although every router can have Internet ac­cess without the added expense of the cellular aircard (if you plug in an Ethernet cable that is wired for Internet service), when you plug in the power cord to the entry-level router, you will be able to create a LAN to output your realtime feed to (no Internet access). You obviously need to have Internet access if you are trying to stream your realtime over the Internet to another location offsite. What’s the difference between the routers? There are a number of different routers on the market to­day that allow you to do a number of different things. The routers in these photographs are entry-level routers (no bells and whistles). Once these routers are plugged into a power source, they create a Local Area Network, which all computers and/or iPads can “join” to be able to receive the realtime feed from your CAT computer. Is a router easy to set up? Yes. It takes less than five minutes. Every router is a little bit different, but the set­up is pretty generic and very easy. You can always push the “reset” but­ton on the back of the router and start from the beginning if it’s just not work­ing. You can’t break it – really! And I ac­tually recommend people resetting their routers two or three times and setting it up again, just to become familiar with the process. It’s simple and quick, once you get the hang of it! You know what they always say: Practice makes perfect! If you think you just cannot set the router up or it keeps you awake at night, take it to the Geek Squad (or someone you trust) and tell them that you want a secure router (with WPA2 security). Choose the password you want (one you will remember) and the name of the network (such as “Realtime”). How do you use a router to write realtime to other computers/iPads? When you plug the router in, you create a Local Area Network that all computers join (including your CAT computer). Through this LAN, your realtime feed is sent to all computers and iPads. What happens if an attorney’s computer can’t join my network? It’s always something! (I had that hap­pen to me, too!) Sometimes attorneys’ computers can be “locked down,” which means their IT department has added Fort Knox security to their computer and won’t allow them to load drivers or even have access to the Device Manager. Fear not! There is still a way! Here’s the quick-and-easy fix to that! As you see in the two lower pho­tos at left, you can use an Ethernet cable (the same cables you use to plug your computer into an Internet source) and directly plug into the computer to re­ceive your realtime feed. That computer automatically joins your LAN by the fact that it is plugged directly into the router. If I am using the smaller portable router (as seen in the photograph), I can “manually” cable in only one com­puter (because there is only one port in the back). But when I use my nor­mal router (Linksys E2500), I have four ports in back (and I always carry four extra-short Ethernet cables), so I can plug up to four computers directly into my router so the will automatically join my LAN. Note: This “fix” is only for computers. It will not work with iPads or mini iPads because they don’t have that specific Ethernet port. Want more details? Contact your TRAIN representative! There is also a comprehensive troubleshooting grid for router issues in the Realtime Trouble­shooting Pocket Guide, Version 2 and step-by-step instructions on setting up a virtual router using Connectify. How do I write realtime to an iPad or other tablet device? Again, check with your specific vendor. Some CAT software have specific iPad apps and others work through a web browser and no apps are needed. To write realtime to an iPad using iCVN (Stenograph) (a free realtime viewing app downloaded from the App Store), you do not need Internet capa­bility, only a Local Area Network. All you do it plug your router into a power source, which then creates your real­time LAN. When your CAT computer and all iPads are on the same network, you start your realtime file, open your app on the iPad, and connect. No ca­bles, no dongles, no hassle! Note: You must purchase a specif­ic license from Stenograph to enable your software to write wirelessly. Bridge is a free software program from Advantage Software that attor­neys use on their laptop computers to receive the realtime feed from the reporter via serial cables or Stenocast. It also works wirelessly using Eclipse’s Shared Document option or Bluetooth network. Stenograph also has a free software program called CaseViewNet that attorneys can down­load and install on their laptop computer to receive a realtime feed via serial cables or Stenocast. To write realtime to an iPad using Brid­geMobile, open your browser and enter the address: http://connect.eclipsecat.com:8880/, which will load the app from the server. Click the lightning bolt to connect, pick your session name, and enter the password, and you’re all set. You can turn the word index on or off, de­pending on your device’s viewing area. Note: You will need to purchase a spe­cific license from Advantage Software (Eclipse) to enable your software to write into BridgeMobile. It’s currently free in its prerelease version. If you need more help, step-by-step instruc­tions on setting up your connection to an iPad using iCVN and for Bridge-Mobile are in the Realtime Trouble­shooting Pocket Guide, Version 2. MyView for the reporter is not free. There is a license fee. MyView for attorneys is free. MyView will refresh if the CAT system has instituted the Bridge protocol that allows “refresh.” The Android version of MyView is available directly from Advantage Soft­ware: http://www.eclipsecat.com/con­tent/myview. Take note that Advantage Software is preparing to replace My­View with their BridgeMobile products. Note: There is a local router server available from Advantage Software, so no Internet needed for local connec­tions with Connection Magic. No app needed, because it runs in the device’s browser, so any tablet, Android or iPad will work, as well as any computer with wireless and a browser. Lisa A. Knight, RMR, CRR, is a freelancer in Littleton, Colo., and co-chair of the TRAIN Task Force. She can be reached at lisa@kicr.net. The U.S. Department of Education has awarded $266,175 each in grants to Prince Institute in Illinois, Huntington Junior College in West Virginia, Cuyahoga Community College in Ohio, and the Community Col­lege of Allegheny in Pennsylvania. The funding is part of the Training for Realtime Writers grants under the Higher Education Act passed by Congress in 2009. The grant program was, in part, approved due to a legislative campaign NCRA launched and supported throughout multiple legislative cycles. Since the Act took effect, NCRA has helped court reporting schools secure more than $16 million in Training for Realtime Writers grants. The schools will use the grants to make improvements to their programs, recruitment of new students, secure scholarship opportunities, and equipment upgrades. “The Training for Realtime Writers grants are vital to ensuring training and job placement for realtime writ­ers who provide court reporting, closed captioning, and services to the deaf and hard of hearing public,” said Glyn Poage, RDR, CRR, a member of NCRA’s board of directors.